Station Hollywood: Superstar Uttam Kumar's memories still haunt filmlovers. Superstar Uttam Kumar's memories still haunt filmlovers. Uttam Kumar’s death anniversary brings great memories of the superstar of Bengal. Again, 24th July, 2018 will bring memories of Mahanayak Uttam Kumar.In 2011, the walls of the Tollygunge Metro Station had been filled with the pictures of films of Uttam Kumar. In fact the people of Tollygunge cannot associate the place without the existence of Uttam Kumar whose works glorified the different studios which carried on the legacy of Bengali Film Industry. Mamta Banerjee, the Chief Minister of West Bengal had also provided support to revive the Uttam Mancha and take care of Shilpi Sangsad, an organization created by Mahanayak Uttam Kumar to help the needy actors, actresses, technicians, etc. Oscar winning director Satyajit Ray acknowledged the dynamic presence of the legendary superstar in Bengali films and made a film Nayak in 1966 based on the story of Uttam Kumar. His original name was Arun Kumar Chatterji, who was a clerk in Port Commission before joining Bengali films. When he joined films with Drishtidaan in 1948, he had to struggle to create his image as against he established heroes like Asit Boron, Bikash Roy and others. In 1952, his film Basu Paribar struck at the box-office and he overtook Bosonto Choudhury, Asit Boron and became the leading superstar of Bengali films. All the qualities of a romantic hero was possessed by him, including a standard height, good complexion, manly voice, romantic hairstyle and unique dialogue delivery. Any dress suited the legendary superstar including Punjabi, dhoti, coat, Bengali dresses, etc. He had acted in the films of all the legendary directors of the golden age including Satyajit Ray’s Nayak in 1966, Chiriakhana in 1967, Tapan Sinha’s Jhinder Bandi in 1961, Upahaar in 1955 and Jotugriha in 1964, Ajoy Kar’s Harano Sur in 1957, Saptapadi in 1961, Suno Bara Nari in 1960, Agradoot’s Bipasha in 1962, Surjo Toron in 1958, Agragami’s Sagarika in 1956, Shonkhobela in 1966, to name a few. Uttam Kumar acted opposite all the leading actresses of Bengali celluloid including Suchitra Sen, Arundhuti Debi, Manju Dey, Sabitri Chatterji, Supriya Choudhury, Mala Sinha, and others. His combination with Suchitra Sen had given everlasting classics and both of them still remains the most romantic pair in Indian silver screen. 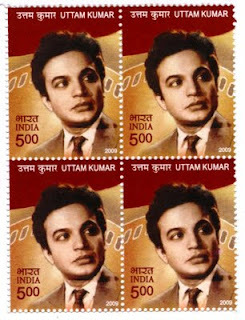 Uttam Kumar’s films were based on rich literature including Tagore’s Khokababur Protyaborton, Subodh Ghosh’s Suno Bara Nari, Samaresh Bose’s Kuhak, Sorodindu Bondhopadyay’s Chiriakhana, Shankar’s Chourangi. The films were related to different types of stories including comedy stories, tragic stories, soft romantic stories, etc. Uttam Kumar had acted in around 205 films (including bollywood films like Amanush, Anand Ashram, Choti Si Mulakat, Dooriyan, Kitaab etc., ) in a span of 35 years, and all his films had remained everlasting treasures. Out of his 205 films, around 37 of them ended up being blockbusters, around 50 were super hit films and around 50 were hit films. Actor Shatrughun Sinha in his interview before Bengali media had disclosed that when he was working in Pune Film and Television Institute, the graduates had unanimous view that Uttam Kumar, Raj Kapoor and Dilip Kumar were the greatest superstars of celluloid and had Uttam Kumar acted in more number of bollywood films, he would have remained as great a legend as Dilip Kumar or Raj Kapoor. Even the singers who had sung for him including Manna Dey, Shyamal Mitra, Hemanta Mukherjee, Manobendra Mukherjee, etc., agreed that they did not find any actor who was parallel to Uttam Kumar in giving lips in songs. He made the viewers feel that he only sang the songs. Actor Shatrughun Sinha in his interview had said that during his student life in Pune Film and Television Institute, the upcoming actors used to debate about the charishma of Uttam Kumar, Raj Kapoor and Dilip Kumar. Although there was no unanimity about the finest actor among them, there was consensus about one fact had Uttam Kumar established himself in bollywood films by acting in more number of films, he would have been equally an international figure like Raj Kapoor or Dilip Kumar. Articles after articles can be devoted to Uttam Kumar who was one –man –industry in Bengali films. His films should be revisited to create motivation for making better quality films in future.